The Amish Pine Wood Burbank Hutch adds storage and warm country style wherever you wish to put it. This solid wood pine furniture performs beautifully in the kitchen when you're baking or cooking, or it's versatile enough to take a spot in the family room or hallway, providing storage and a space for books, mail collection and more. 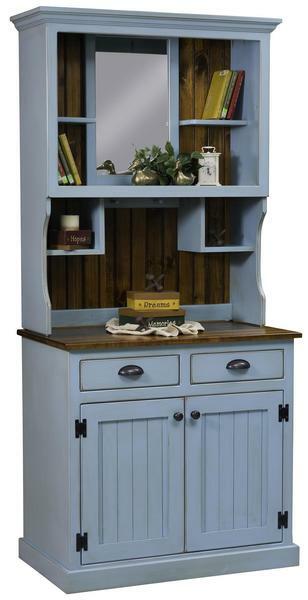 Built by the Amish with solid pine wood, the Pine Wood Burbank Hutch is offered at a great price. Distressing options create a time worn look. Amish craftsmen use various tools to make marks on the wood like indentations, wear points and rasp marks to create that loved and lived look. With custom furniture you have the option to select just the amount of distressing you want. Choose light to heavy distressing or explore sandblasting or wire brushing. Our Wood Furniture Distressed Finishes blog lays out all your options for distressing techniques in a quick and easy guide, or you can take a peek at the What is Distressing?video for a run down as well. The options you choose for your Amish Pine Wood Burbank Hutch will create a look that's unique to you. With a variety of stains, paints and distressing options available, there's no limit to the creativity at your disposal. We'd love to assist you with the design of your new wood hutch. Please feel free to get in touch by email or phone for help, and a Furniture Specialist can guide you through options. We thank you for shopping with DutchCrafters. Shown in Seafoam Top & Back-Michael's Cherry.